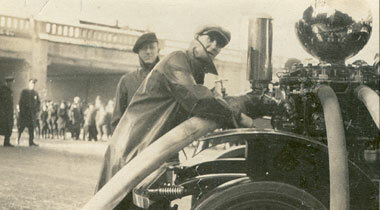 A 1921 Ahrens Fox Model P-4 1300 gallon per minute pumping fire engine. As quoted by the Madison Eagle on July 30, 1920, "Madison will be the possessor of an Ahrens-Fox pumping engine of the latest and most modern type....The Ahrens-Fox engine which Mrs. Geraldine R. Dodge is presenting to the borough is the largest piece of fire-fighting machinery ever built by its manufacturer." 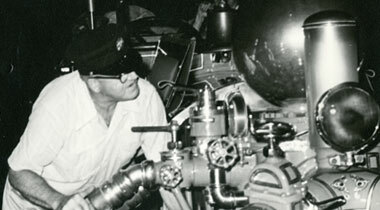 At the time, similar pumping engines were used by the Morristown Fire Department. There is no doubt the Ahrens-Fox was the "Rolls Royce" of fire engines. The large silver ball the truck carried in front of the radiator distinguished the Ahrens-Fox from all other fire apparatus produced. The hand-produced "ball" was actually utilized to eliminate the pulse or spurts produced by the six-cylinder piston pump's water flow. As delivered, Madison's Fox rode on wooden wheel rims and hard rubber tires. Later in its career it was equipped with pneumatic tires and, eventually, a windshield complete with wipers. The 'P' Model was by far the unsurpassed model of the best fire engine. Most common models purchased by cities like the City of Newark were M or N models:, 750 gallon per minute pumping engines that cost under $10,000. This was not good enough for Mrs. Dodge; she wanted something much better. The 1921 Fox cost a whopping $18,000 and even came with a customized plate reminding everyone the engine was a gift of her generosity. The pump is known as the "Twin Triple" piston type, and boasts a pumping capacity of 1,300 gallons per minute at 120 pounds net pumping pressure. It has 6 cylinders and, a wheel base of 179.5 inches with the turning radius of 30 feet. The Fox is also equipped with a 12-inch universal search light. Additional equipment will include the most modern devices to thaw out frozen fire hydrants, 1,500 feet of supply hose, and several fire extinguishers. 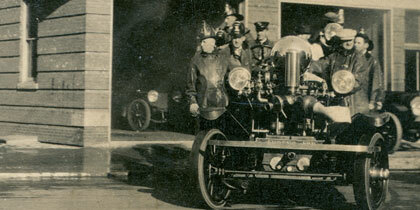 On May 14, 1921, a parade attended by over ten thousand welcomed the new fire engine to Madison, New Jersey. The parade started at 2pm and was led by Madison Police Chief Johnson and his aide, The followed by the new Ahrens-Fox was next in line followed by (in order):. Fire Chief Samuel A. Gruver and his Assistant Chiefs, the Hook & Ladder Company, the 1910 Webb Engine, the Supply Wagon, Voss' Band, the Hose Company, and the Board of Fire Wardens. The parade route taken was: Central Avenue to Main Street, right onto Main Street, left onto Madison Avenue to Kings Road, left onto Prospect Street, left onto Main Street and left onto Waverly Place. 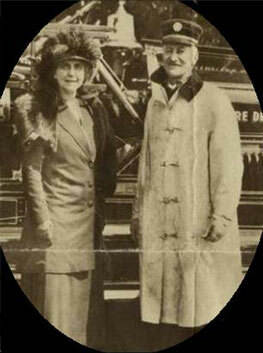 The reviewing stand on Waverly Place consisted of the Mayor of Madison joined by Mrs. Dodge and numerous visiting city fire chiefs and visiting Mayors. Frank Waters presided at the presentation of ceremonies. Mayor William A. Starrett accepted the gift on behalf of the Borough and Madison Fire Department. The engine made a demonstration at the corner of Prospect Street and Kings Road, the current site of the Madison Public Safety Building. The band continued to play on Waverly Place until 6pm. 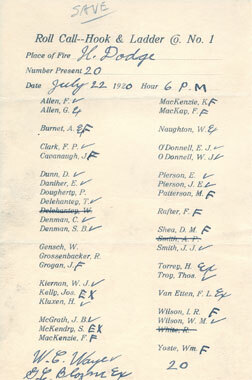 Fire Chiefs in attendance: Chief Bowler of Passaic, Chief Coyle of Paterson, Chief of Moore of Newark, Chief Williams of Montclair, Chief Mitchell of East Orange, Chief Matthews of Orange, Chief Gerstung of Elizabeth, Chief Francis of New Brunswick, Chief Feirling of Plainfield, Chief Boyle of Jersey City, Chief Davis of Bayonne, Chief Brewster of Summit, the Fire Commisioner of the New York City Fire Department, Fire Marshall E.S. Amerman of Morristown and Boonton 1st Assistant Chief Vandyne. As reported by the Madison Eagle "While coming through Chatham on his way to Madison, Chief Brewster, of Summit, was arrested for speeding and fined $2 and costs." The dinner commenced at the firehouse (which was elaborately decorated) at 8pm, and Waverly Place was closed in both directions was closed to allow the public to join the band and the party. All dignitaries attended the dinner; this included the visiting Fire Chiefs, Mayors, former Mayors of Madison and, of course, Mrs. Dodge. The Boy Scouts stayed in uniform and maintained order while distributing souvenir programs of the celebration. The new Ahrens-Fox equipped the Madison Fire Department with a second pumping engine in addition to the Hook & Ladder Truck and Supply Wagon. The Fox provided the Rose City with fire protection for over forty years until a part's failure at the St. Vincent's Church fire in 1952 interrupted it's water flow for some twenty minutes until temporary repairs could be made. Deemed as unreliable after that event, it was placed in reserve and eventually replaced with a new 1960 Mack pumper before being sold to a fire department in Ashley, Pennsylvania, for parade duty. After three years, that community sold it to Harrah's in Reno, Nevada, for display in an antique automobile collection. At this point in time it wore Ashley's name on its hood, not Madison's. When Harrah's collection was auctioned off in 1983, it passed into the hands of private owners, disappearing from public view.